What a bonkers week it’s been. I started a new freelance job, back working in TV, and the first time I’ve worked out of somebody else’s office in over 12 years. Now every day has a thrilling air of Just how feral have I become? as I realise that there is more than just me and Dennis the cat who can hear me singing Eighties electronica or see me marching on the spot. (Top tip for FitBit wearers – if you are trying to catch up on your step total for the day, I recommend cranking up the old Youtube and marching to Eighties electronica. Only if you work from home though. Not in anybody else’s office. Definitely definitely not). Also last week I gave a talk about social media to the Guild of Food Writers, who turned out to be a most excellent bunch. And then I boinged back to London again for the Omniya London bloggers event. I mainly went to this event because it was exclusively for bloggers over 30. 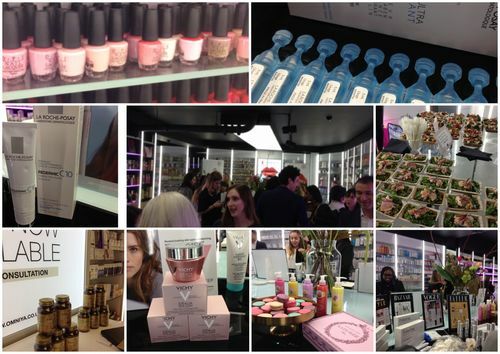 You would not believe how many beauty blogger events are empty of people over 30. We just don’t get invited to some things, I guess because we would stink up the room with our aged faces and general feralness. Then we would hit the bar and start singing Eighties electronica and nobody needs to see that. But no matter, it’s their loss. So I want to say a big thank you to Hayley at London Beauty Queen and Omniya London for hosting this truly lovely 30 plus blogger event. Nobody in my real life likes to talk about skincare and weird face juice, but this was a room where you could do so with freedom. 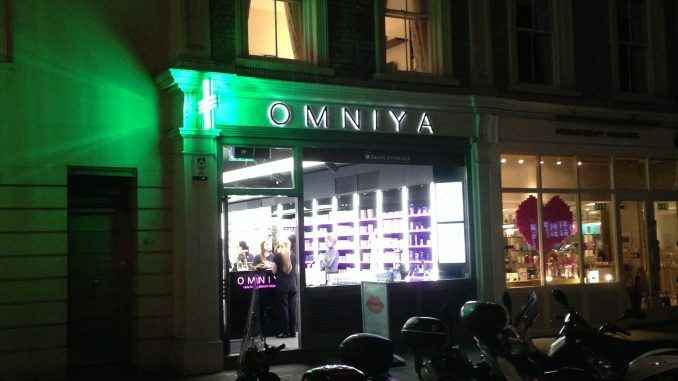 Nestled in the shadow of Harrods, Omniya does a pretty good impression of a French pharmacy like the ones I visited in Paris. The shelves are lined with oodles of cool skincare brands, some of which you’ll know and others which are exclusive. It’s skincare geek heaven, with lots of innovative stuff to try. 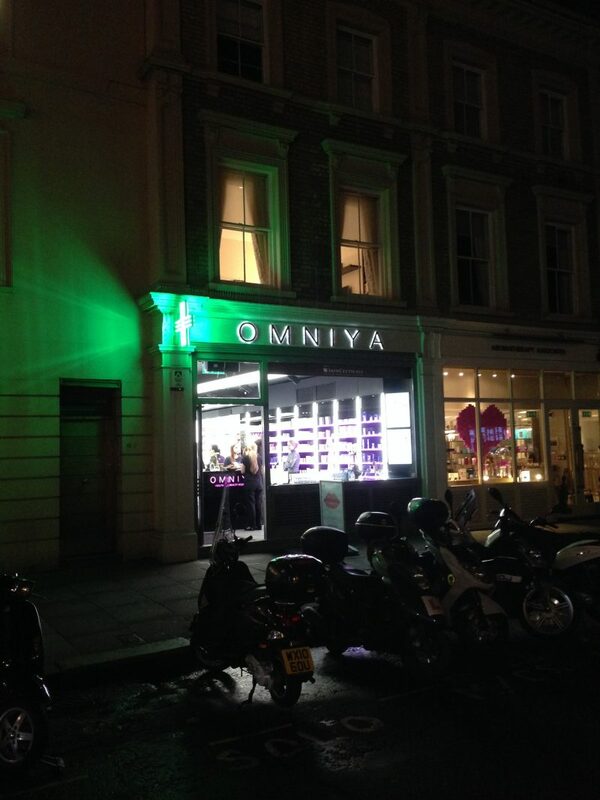 Omniya bills itself as a ‘Health and Beauty Mediclinic’ which means that it is part treatment rooms, part pharmacy and part health and beauty retailer. I’m not aware of anywhere else in the UK quite like it, especially with such a range of cult and niche skincare on offer. If you’re in the Kensington area definitely drop in for a nose round, the shelves are packed with finds. As Omniya opened its doors to the 30 plus bloggers, the room was made even more appealing by beautiful flowers from Bloomon and healthy minimeals from Treat. It was one of the friendliest blogging events I’ve been to; both brands and bloggers alike were incredibly warm and up for a chat. I think I was a bit worried that a beauty event might be a bit scary with people judging if you were wearing the wrong shoes or whatever, but basically it was a bunch of nice people in a cool room, with macaroons. If only every blogging event could be like this. Also I got through the night without falling over or singing some Eighties electronica so RESULT. When we were left were given an utterly cool and amazing gift bag of products to try. 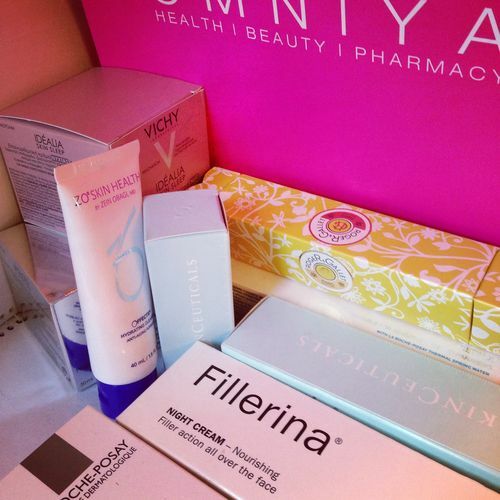 Some were from brands I’m already a big fan of, like Roger et Gallet, Vichy and La Roche Posay, others were from brands new to me like Fillerina and Zo Skin Health. Plus there was a chance to try some of the heroes of SkinCeuticals line. So right now I’m resisting the temptation to throw it all at my face at once. I think some of the products will have to go towards a future giveaway because, you know, it’s nice to spread the love around. I’ve started using the Fillerina night cream as this is apparently a no-needle dermo-cosmetic filler which contains no less than six types of hyaluronic acid. I didn’t even know there were six types of hyaluronic acid.You learn something new every day. You can find out more about the 30 plus blog collective here.